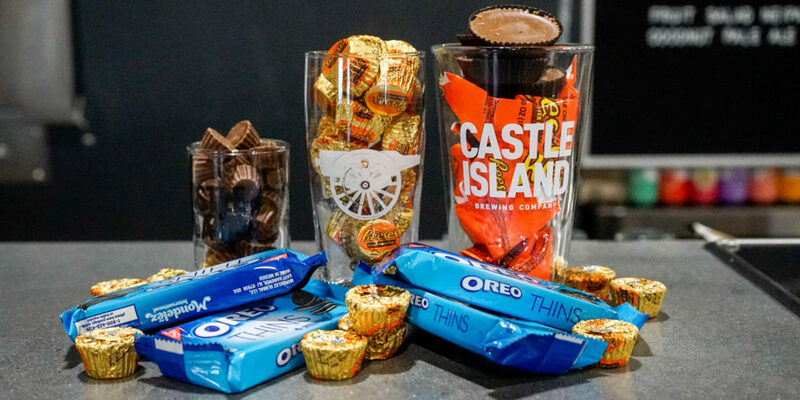 A Treatise on the Criticality – and Flexibility – of Food Ratios – Castle Island Brewing Co. Pop quiz. What’s one of the top-selling candies in the US? If you didn’t guess the Reese’s Peanut Butter Cup, you probably either had a supremely boring childhood or have a severe peanut allergy. But like it or not, those orange-wrapped wonders dominate American demand for chocolate-fueled sugar highs. But why the hell do we crave them as much as we do? It’s not because of the chocolate – the Swiss have cornered that market. Nor is it because of the peanut butter filling, evidenced by the relative flop of Reese’s Peanut Butter (ew). No, friends, it’s not because of the two main ingredients, but rather because of the ratio of the two. That’s right – the ratio. The eponymous Halloween candy crushes the competition because of math. Nerds, rejoice. Come on, don’t act surprised. This isn’t the first time you’ve considered it. Just think about it – what’s better: the PB mini, the PB cup, or the Jumbo cup? The answer is the cup, not the mini. And for the sickos out there that said the Jumbo, I don’t even know you anymore. Just imagine you order a burger at a restaurant, only to discover upon delivery that the bun outsizes the burger by 3-to-1. Or, worse, that the burger outsizes the bun by 3-to-1. Now, technically speaking, they’re both burgers – in as much as a burger is a puck of ground beef sandwiched between two slices of bread. But the former may as well be a bulkie roll with a meatball inside, and the latter meatloaf with toast squares. Your perception of the burger is distorted, all because the chef (who’s had a tough day, by the way) decided that ratios don’t matter. But they DO matter. Ratios are literally the only thing saving your burger from becoming a meat nugget or beef-loaf. And face it – if you wanted one of those, you would have ordered it. So you’re probably asking yourself, “what on god’s green planet does this have to do with beer?” Well, the thing is, if you look for it, I’ve got a sneaky feeling you’ll find that ratios, actually, are all around. Just consider this: Oreos, Oreo Thins, and Double-Stuff Oreos are literally the exact same thing, just in different proportions. Now me, I’m an Oreo Thin guy. Fewer cals, more pronounced crunch, and I can eat more before feeling like I’m making irreversible life decisions. But a quick survey of the bar shows a well-distributed preference for all variants of the Nabisco classic. Ask around, and you’ll see that everyone has a favorite. But they’re all open to new frontiers; the double-stuffers will venture into the territory of the thinners, and vice versa. There’s a tacit acknowledgement that consistency of ingredients across varying ratio gradients shouldn’t be a barrier to cross-product experimentation. So, Mister “Hops are gross”; Miss “I only drink IPAs”; Chancellor “Stouts or bust” – take a shot at something new. Try on a new ingredient ratio; keep an open mind and see if it fits. You may be pleasantly surprised. But you’ll never know if you don’t try. After all, Oreos have been around since before the Titanic set sail, but the far superior Oreo Thins didn’t come out until 103 years later. Thanks to The Abbey, in Cambridge, who supplied the delicious burger I dined on while writing this. March Madness Pop-A-Shot TournamentIntroducing: Castle Island Classics!